Kat Griffith is congratulated by College of Arts and Sciences Dean Greg Simpson during commencement May 10, 2014. Earlier this year, School of Social Work graduate Kat Griffith, M.S.W. ’14, sat at a table in Washington, D.C., with policy makers, advocates and members of President Barack Obama’s administration, discussing the perils HIV-positive women face in abusive relationships. For decades, Griffith has been an advocate bringing light to the intersection between HIV and women in abusive relationships. Her invitation to the White House is only one step in a battle that is deeply personal. More than 280,000 women in the United States are living with HIV, according to a 2013 White House report. The Positive Women’s Network (PWN) conducted a survey published last August that reported 67 percent of HIV-positive women polled had experiences living in abusive relationships—more than four times the national average. The same report found that two-thirds of the respondents—all HIV-positive women—had experienced sexual violence at some point. 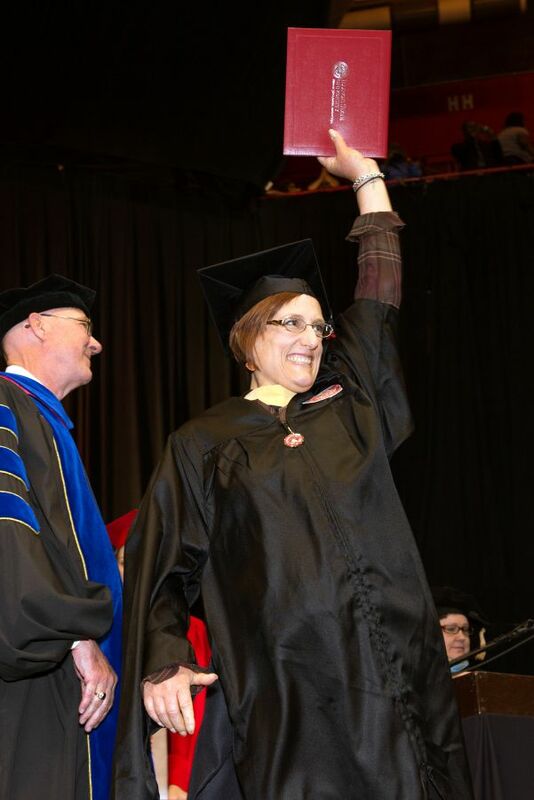 Griffith celebrates at her May 2014 commencement. The May 2014 graduate has been active in the PWN since 2008, which led to work on the Illinois Alliance for Sound AIDS Policy and the advisory committee for National Network to End Domestic Violence. Griffith work earned her the invitation to the White House for a discussion with policy makers as part of a federal working group exploring the intersection of violence and HIV for women. Beyond all of the statistics, the fear is something Griffith understands well. She became infected with HIV after an abusive relationship 24 years ago. For years, Griffith fought to make policy makers understand the dangerous connection between abuse and HIV for women. Yet it was not until the 2013 Lobby Days in Springfield when she publically embraced an added element to her role in the fight. It was here, speaking for the AIDS Foundation in Chicago, that Griffith talked openly about her own diagnosis. Griffith’s personal fight nearly took her life. In 2004, she developed toxoplasmosis and later posterior reversible encephalopathy syndrome (PRES syndrome) as a result of HIV. For the next three years she combatted her body rejecting her medicine, with episodes of everything from brain lesions to seizures that placed her in a coma for three days. The years of intense illness shifted her life. “Coming through this, I really struggled with the realization that I had a voice that wasn’t being used because of fear of rejection in my profession,” she said. Leaving her role as a horse trainer, she renewed her advocacy, which led her to graduate school at Illinois State. The stigma of being HIV-positive can carry real danger, said Griffith. She pointed out the case of Cicely Bolden, a woman in Texas murdered by her boyfriend when she came out to him as HIV-positive. Stories like Bolden’s once caused Griffith fear, but now fuel her work. And she believes there is much work to be done, that the U.S. still has a long way to go pulling itself from the belief that HIV is an illness to be swept under the rug. She referred to a recent Kaiser Family Foundation study that found most people believe HIV to be a disease of the past, yet still want those infected to be isolated. “In the HIV battle, we are very far ahead scientifically, and in some respects we are a more educated society, but I think now the general population—especially the white, heterosexual population—thinks this is a disease of the past, a disease of someone else, and it is gone anyway because now there are pills. And I hear that a lot. But those people who think it is over are still afraid to share utensils with an HIV-positive person,” said Griffith. Griffith continues her work to keep the intersection between violence and HIV at the forefront. After 24 years of living with HIV, Griffith knows her fight—and her advocacy—are far from over.